Ethan Pezzolo, Janine Caceres, Sophia DiMatteo and Alexander Pearce (from left to right), with supporters standing behind them, hold a press conference after their court appearance on July 27. Photo by Casey Amaral. Nearly a month after five of the “Highway 6” students were sentenced to 30 days in jail with eligibility for custody alternative programs like house arrest and three years of informal court probation, the last defendant was handed the same sentence in court on July 27. Co-defendant Rosa Petterson, whose attorney was out of the country during the original sentencing date, said she plans to apply for house arrest. The final restitution hearing, which was expected to occur July 27, was pushed back to Aug. 18 because Petterson’s attorney requested additional live testimony with the UC Santa Cruz police department representatives, Lt. Glen Harper and business manager Jimmy Wise, who were present during the first restitution hearing. On Aug. 18 the six students’ final restitution cost will be finalized. Last month Judge Denine J. Guy tentatively assigned about $28,000 — $22,335.22 for UCPD, $2,301.83 for the California Highway Patrol and $3,294.44 for the Santa Cruz Police Department (SCPD) — for the total restitution costs. Criminal restitution is the amount of money awarded to victims of cases, which in this case are the government agencies responsible for responding to the March 3 protest at the freeway fishhook. The prosecutors and the attorneys of the six co-defendants will also present their final arguments after further testimony is given. Dmitry Stadlin, defendant Janine Caceres’ attorney, made his final argument early in court because he is unable to appear for the new sentencing date. He fought for a total restitution cost of about $10,000, calculated by subtracting costs not directly associated to the six student’s actions between the hours of 9 a.m. to 2 p.m. Stadlin said California Highway Patrol and SCPD charged for officers who didn’t respond to the protest, and overtime pay beyond the scope of the defendants’ actions. He made the case for a significant drop in UCPD’s restitution — from about $22,000 to $8,000 — by saying Harper couldn’t differentiate the UC vehicles used on the highway or used for normal patrol. Wise testified that the extra vehicles were requested before the demonstration on the freeway. On January 22, after final restitution is set, the students will reappear in court to update Guy on their payments. 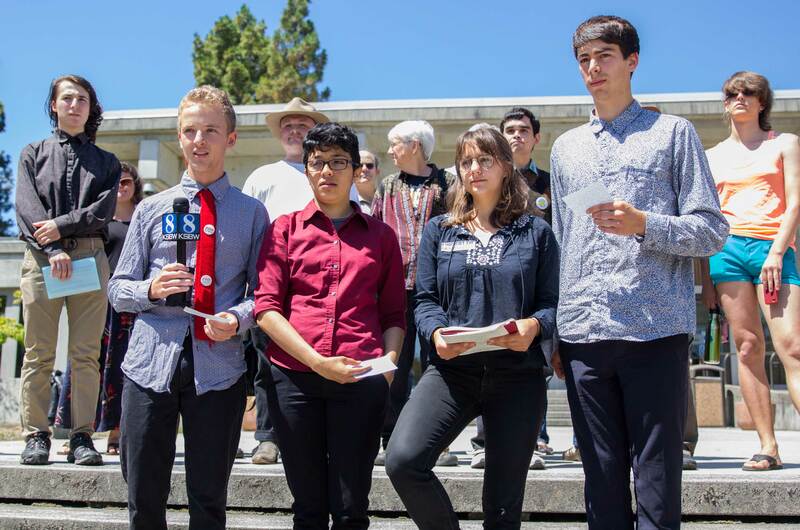 After the short court appearance, co-defendants Ethan Pezzolo, Sophia DiMatteo, Janine Caceres and Alexander Pearce briefly held a press conference to address the increasing inaccessibility of public higher education and the state’s focus on funding the prison system over education systems. Pearce also spoke on the criticism of their action by community members. With UCSC’s judicial process completed, DiMatteo, Cacares, Pearce and Pezzolo are eligible to return as students this fall, instead of fall 2016 as originally determined. Lori Nixon and Petterson are eligible to return in winter 2015.